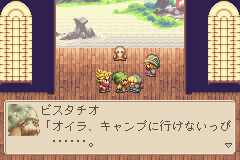 OverviewOne of the GBA's earliest RPGs. 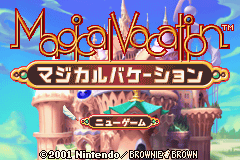 It was also Brownie Brown's very first game after they completed Legend of Mana and left Squaresoft. Now you can add videos, screenshots, or other images (cover scans, disc scans, etc.) for Magical Vacation (J)(Eurasia) to Emuparadise. Do it now! If you haven't noticed yet, we have a retro game of the day feature (top-right of the screen) wherein we feature a new retro title every single day! Now, you can vote for your favorite games and allow them to have their moment of glory. 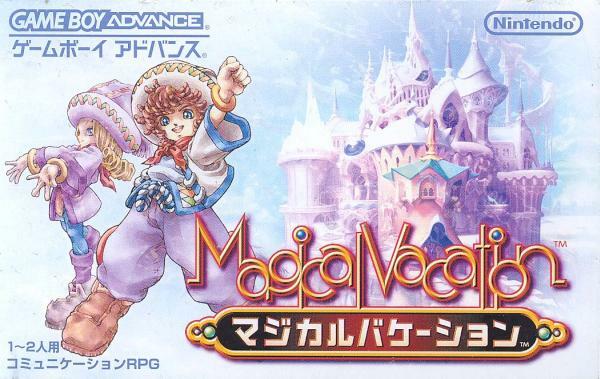 Click on the button below to nominate Magical Vacation (J)(Eurasia) for Retro Game of the Day. You have the option of playing Magical Vacation (J)(Eurasia) in your browser, right here at EmuParadise! No need for any software, no installations required, all you need is a fast enough PC and a browser with Flash support. This is great if you're on a PC with restrictions on software installations or want to secretly play at work. : the design team that brought you the Secret of Mana series on the SNES. : of the game makes us all wonder if something much more is in the cards. : of that project has carried on to Magical Vacation. :   * From the creators of Secret of Mana. :   * Luscious hand-drawn graphics. :   * Possible multiplayer adventure via Link Cable or Mobile Adapter. : Nightfall, Oldskool, Paradox, RSiso, & Venom.